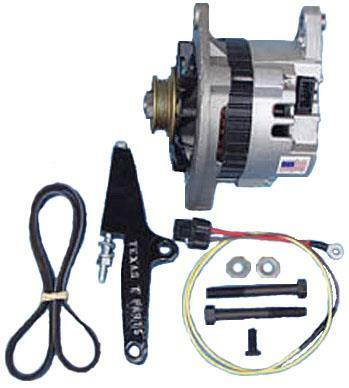 External Alternator, with internal regulator, designed for use on cars without starter or generator, belt driven, mounts on driver's side of engine. 12 volt, Now with best Quality Delco alternator that has larger cooling fan and vents. Comes complete with all brackets, bolts, crank pulley and belt.